Recreation spaces in residential areas remain a priority, especially at a time when there is pressure on land for new housing. UK wide charity, Fields in Trust, in partnership with HAB Housing, are marking an innovative collaboration which will secure recreational land in perpetuity as part of a new housing development at Winchester, Hampshire. 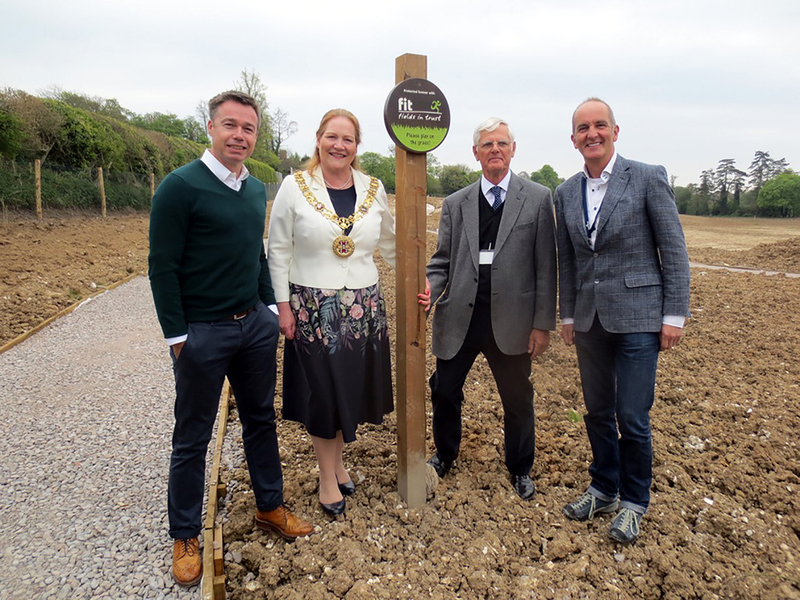 A plaque was unveiled at the site by HAB Housing Founder, Kevin McCloud and Fields in Trust Trustee and former international footballer, Graeme Le Saux, to mark the safeguarding of the site. Mayor of Winchester, Councillor Jane Rutter and Chairman Kings Worthy Parish Council Stewart Newell, were also in attendance. 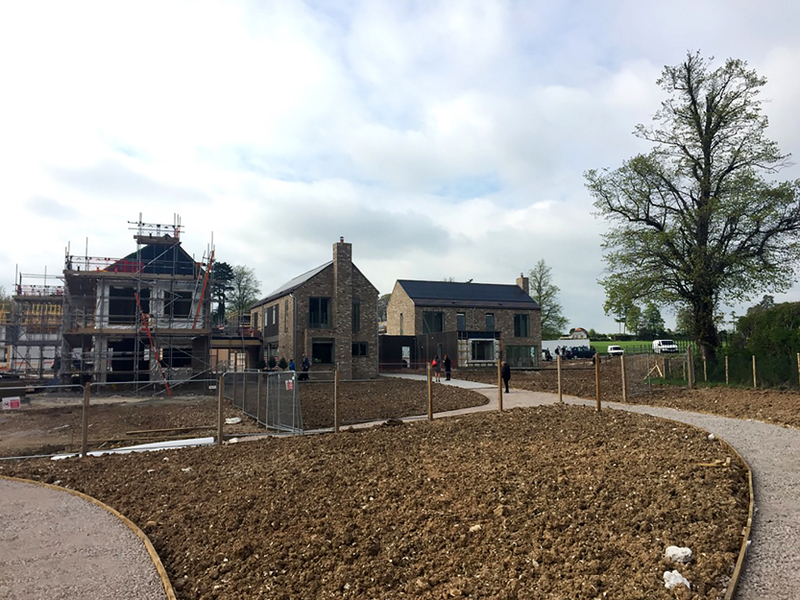 The semi-rural site on Lovedon Lane, in the historic village of Kings Worthy, is two miles from Winchester and is being developed with, allotments, wildflower meadows, play areas, a running circuit and a community orchard area. Once the development is complete and ownership transferred to the local Parish Council, this will complement the existing facilities in the adjoining Eversley Park, with its football pitches, playground and basketball and tennis courts. There is an urgent need to build new homes across the UK and sometimes hard choices have to be made. Fields in Trust believe that all communities, and particularly young people, should be able to enjoy healthy, active, outdoor recreation within walking distance of home. As well as protecting recreational space via a legal mechanism, the charity Fields in Trust produces benchmarks for accessible outdoor space. The “Six Acre Standard”, recommending adequate recreational provision, has been accepted and implemented by local councils since the 1930s; the latest version “Guidance for Outdoor Sport and Play” was published in 2015 – Lovedon Fields conforms to these latest guidelines. The design of new housing can play an important role in facilitating social interaction and creating healthy, inclusive communities. Recreation spaces in residential areas remain a priority for protection, especially at a time when there is pressure on land for new housing. The innovative HAB Housing development has taken a pre-emptive approach and designed-in recreational space from the outset which has been safeguarded with a Fields in Trust “deed of dedication”, ensuring that the land will be protected for community use, in perpetuity. This makes properties at Lovedon Fields attractive as buyers can be assured that local open space will be safeguarded forever. Land owners, local authorities and enlightened developers working with Fields in Trust can secure their green spaces through a legal mechanism; ensuring public recreational land is protected forever. Fields in Trust currently safeguards over 2,600 sites, a total of 30,000 acres of land (12,140ha.) including playgrounds, playing fields, and formal and informal parkland across the UK. Environmental design of the landscape, sustainable water management and ecological features of Lovedon Fields take account of local wildlife and are a vital part of the design. Spaces for swallows, slow worms, bats, hedgehogs and insects have been incorporated throughout the scheme. Every home includes an integrated micro-habitat for bats, birds or even the honeycomb-like Bee Bricks to help house the pollinators of the wildflowers in the new parkland. Homes benefit from highly energy-efficient construction and also generate significant electricity from solar panels controlled by a smart home heating controls via smartphone, tablet or computer. There will also be a shared car club on site - for the use of everyone at Lovedon Fields as well as the wider community.